She’s come quite a long way from Gilead. Emmy-winning The Handmaid’s Tale star Elisabeth Moss plays self-destructive punk rocker Becky Something in the new teaser for writer-director Alex Ross Perry’s latest, Her Smell. The new teaser finds Moss’ Becky looking particularly unhinged, unleashing a feverish monologue to the cameras backstage before a show. 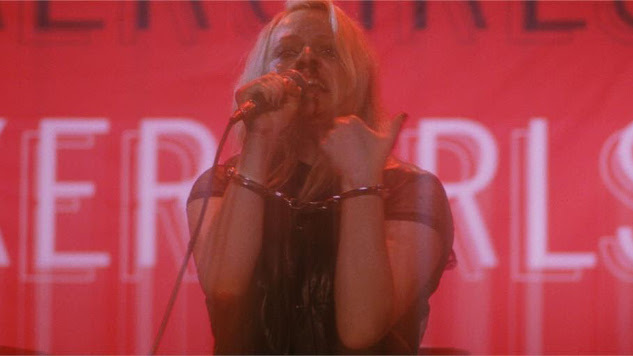 Her Smell follows troubled Becky, leader of an all-female rock band called Something She, as she struggles with stumbles in her years-long struggle with sobriety, restoring her band’s lost creative spark, mentoring an up-and-coming female band called The Akergirls, led by Cassie (Cara Delevingne), and watching her former bandmate Zelda E. Zekial (Amber Heard) rising to stardom as her own career falters. Only when Becky hits rock bottom, having lost ties to her young daughter and estranged husband Danny (Dan Stevens), will she get on the path to redemption. Agyness Deyn, Gayle Rankin, Ashley Benson, Dylan Gelula, Virginia Madsen and Eric Stoltz also star. Psychological dramas about abrasive, self-destructive characters seem to be something of Perry’s stock-in-trade, as we’ve seen in his previous Listen Up Philip and Golden Exits, although he took a bit of a detour into sentimentality as one of the co-writers on Christopher Robin earlier this year. Moss has previously teamed up with Perry in Listen Up Phillip, and in the 2015 psychological thriller Queen of Earth, in which she played another emotionally unstable protagonist, this time during a nervous breakdown at a week-long lake house getaway with her increasingly distant best friend. By the looks of it, though, Moss is giving a more defiant performance in Her Smell than we’ve ever seen from her before—not even in her spunkiest moments as Peggy Olson in a 1960s ad agency on Mad Men, and certainly not in her performance as one of the oppressed women inhabiting the totalitarian world of Gilead in The Handmaid’s Tale. Her Smell makes its world premiere this Sunday, Sept. 9, at the Toronto International Film Festival. Watch the teaser below.